April | 2014 | My Health! My Choice! Of course, such statements belie an attitude related to the rest of my food views that got me in this trouble. I know I have to accept vegetables onto my plate (other than potatoes, corn and peas). The problem is that I really don’t want to. Have you ever had someone that, for whatever reason, you were forced to get along with, while being secretly repulsed by that person? 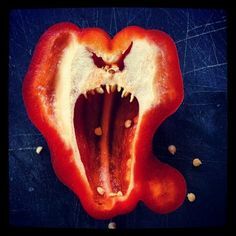 Well, that is my new relationship with vegetables. It’s not as simple as not liking them. I loathe them! They have no appeal to me whatsoever. But just as I had to get over the idea that smothered and covered was food’s natural habitat, I have to get used to the idea that I am an omnivore—I can and must eat veggies. So how can I get over this? In the past I’ve used the usual methods. Anything tastes good if covered in enough cheese. I’ve also happened upon a few things that I either like or can tolerate in their own right—asparagus for example. These latter things have come through experimentation and through familiarity. This I think is the way to cross over to a healthier diet. I have to give the veggies a chance—just as I’ve had to do with some repulsive people. I have to experiment with new seasonings, preparations and presentations. Right now I’m on a search for these, but sometimes I have to knuckle through and settle for the few things I like to simply make sure I get my green portion. If I have to knuckle through the rest of the year I will, but it want to finish the year with a fresh appreciation for things I once didn’t like. So, I can still say, “I don’t want to die with broccoli on my breath.” But perhaps I can live a bit longer that way. 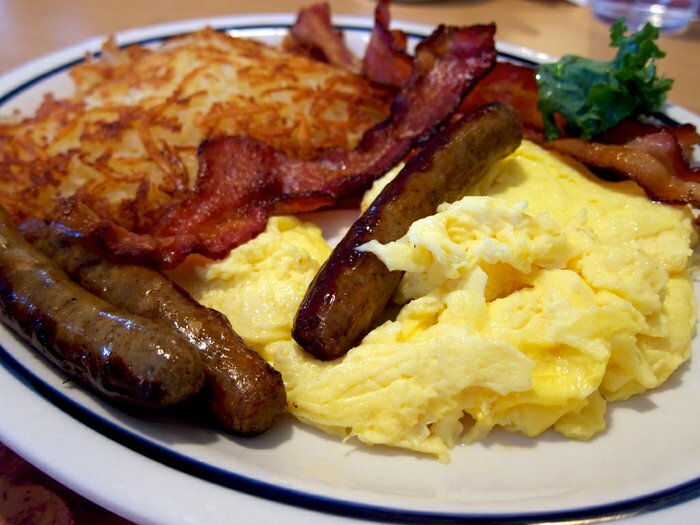 Saturday, I attended our church’s monthly men’s breakfast at a local diner. It’s a nice place. We enjoy the food there. And the atmosphere encourages good conversation. My biggest concern was keeping myself on track with my diet. I did research and found the diner’s menu on the internet, but they offered no meals or even a la carte items permitted by my program. I had a choice—being the pastor meant not attending was not an option. One option was to order nothing, limiting myself to the permitted cups of coffee and a meal replacement bar. I chose instead to order some hard boiled eggs (permitted on my program, but only once a week). I couldn’t find of a vegetable to order; so, I ended up without a green for one of that day’s meals. That wasn’t the best choice, but I felt it was better than dropping off the program for one meal and trying to restart. This worked fine. I continued the rest of the day and felt a bit sluggish, but otherwise fine. The hardest thing with such times is not the discipline when ordering. The hardest thing is maintaining the discipline around those who are not restricted in their eating. Looking around the table at bacon, eggs and sausage gravy poured over flaky biscuits could have been torturous. Such foods are some of my favorite and trigger wonderful comforting memories. It was easier since I am convinced I don’t want those things. I don’t say this because I have had some miraculous change to my tastes or change to my taste buds. I still love the taste of such foods. We all have to admit “diet” foods are not as tasty as their full fat, greasy, artery clogging counterparts. This is just a fact of physiology. Our bodies crave high energy foods requiring the least calories to collect and digest. We are hard-wired this way. Consider my experience with soda. I grew up in Texas where, of course, ice cold carbonated beverages are a staple. Every such beverage is called a ‘coke’, and one of the most popular forms of ‘coke’ is Dr. Pepper. Many years ago, I had a strange change come over me. I no longer wanted soda. It wasn’t that I decided soda was bad for me. I wasn’t convinced to stop drinking it. It wasn’t that I no longer liked the taste. I just didn’t desire soda anymore. People could drink it around me and there was zero desire for one. This made me start thinking about the other foods I like. If I no longer liked them I could stop eating them and lose weight without trying. I tried this with ice cream. I tried to convince myself “I no longer like ice cream,” hoping this would help end the temptation to eat ice cream. Needless to say, it didn’t work. But that is the problem. We can’t control what we do and do not like–turning it on and off like a switch. I still love all the foods my friends ate on Saturday. While I can’t control what I like—tastes, experiences, chemistry, and so many other factors control this—I do have some say in what I desire. It is too easy to confuse what we like and what we desire. We think saying, “I like that” and “I desire that,” are synonymous terms. They are not. They are related, but different. They can both be related to the idea of “wanting,” but they differ. For one thing, liking can trigger wanting which can be experienced as desire, but liking something does not equate to wanting or desiring something. For example, we often think saying “I like eggs,” is the same as saying, “I want eggs.” They are not. Pointing at a woman and saying, “I like her,” is not the same as saying, “I want her.” In this example the difference comes into sharper focus. While my friends’ breakfast foods were all things I like, they were not what I wanted. They brought no temptation and no feeling of being deprived. But what causes this. Why do foods which would have tempted one day, fail to temp another day? 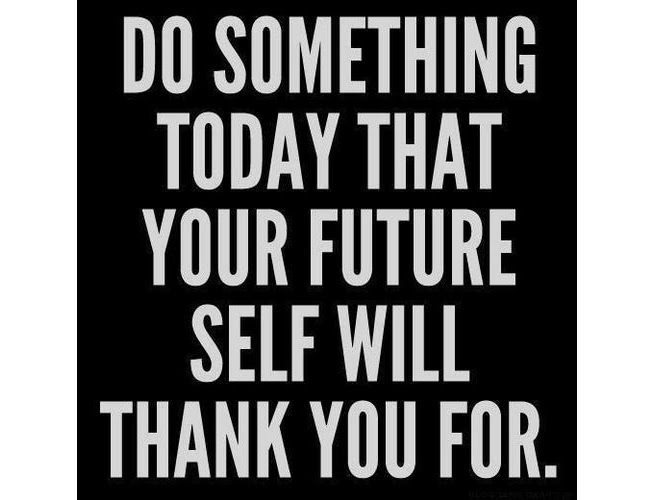 I think the difference is seen in how we put off a powerful desire for immediate gratification in favor of future benefits. It is a matter of what I want. It is also a matter of when I want it—not when do I want to have it, but when do I have the desire for it. When trying to lose weight with a diet, giving in to the temptation to eat other foods shows I wanted the food (or the pleasure of experiencing it) more than the benefits of the diet. Part of our guilt comes from knowing we should have wanted the goals of the diet more than temporary gratification. Our feelings of guilt are not limited to guilt over our actions. We feel guilty about the values our actions display. Many are going to wonder how someone who just started a program to regain his health can claim such knowledge about temptation and desire. For one, I have thought long and hard about the things that drive me to eat. I know there is something psychological encouraging me to choose the quick, easy pleasure of food over the long term, hard fought pleasures of health. Those, I am still working through. But there is one other place where I have had this same conversation. As a pastor, I often counsel people over sexual misconduct–who have traded a lifetime of a healthy loving relationship for temporary pleasures. Our sexual drive and our drive for food spring from the same place. Have you ever considered the sexual nature and feel of our most decadent foods? We even call such foods ‘decadent’—a word synonymous with ‘immoral,’ ‘degenerate’ and ‘perverted.’ When talking to a dieter who has binged on forbidden foods or a husband who has strayed in his marriage, the words and the emotions are almost indistinguishable. In both situations, the results can also be life altering for both the one ‘cheating’ and for their loved ones. How did I sit with other men who were all eating my favorite foods and limit myself to boiled eggs and coffee? Because at that moment I wanted boiled eggs and coffee, which represented much more to me than the temporary pleasure of those other foods. Of course, this will not always be the case. There will be times I want food I can’t have. For example, I am starting to get bored with my food choices allowed in my Lean & Green meals. I’m looking for new ideas before this feeling leads to a desire to quit. In those times other things may have to step in to keep me in track. One thing that helps is removing some of the potential for pleasure from cheating. If a tempted husband knew others would find out about his dalliance, most would find resistance far easier. It is the secrecy that makes it easier for one to cheat. Fear of scorn and shame are powerful forces in humans. It helps to have accountability—people who will know if you cheated. This is one reason I blog about my experiences. Friends nationwide know about my diet and will read this. Yes, I could eat what I want and then fake it, but that is hard when one of those friends is at the table. Transparency helps as well. One thing that made it easier to hide my unhealthy behavior was that my build hid much of my weight from most people. Even at my heaviest, people knew I was overweight, but had no idea how much. Neither did they know the extent of my health problems. In my opening blog I shared my actual weight with the world and shared my health conditions. For someone with my background being like this is shame-inducing. The sense of embarrassment over my true health is a powerful motivation to turn it all around. I am driven to correct the situation, thus replacing embarrassment with a sense of pride—another powerful force in human behavior. If you are reading this on your own journey, what should you take away from it? If you haven’t been honest about where you are, secrecy can undermine your resolve. The best thing to do is shine the light of truth upon your condition, and admit to others where you are. There is a good reason “Friends of Bill” (AA, NA, etc.) introduce themselves with a public admission of their addiction. Next, if you are trying to struggle alone get friends who will hold you up when needed. I don’t mean feel good friends who will enjoy the ride as you eat and drink yourself to an early grave. I mean real friends who will insert a boot up your “fourth point of contact” when needed. Finally set a goal for yourself—both measurable and feel-good goals. I have several measurable goals that work in stages—and none of them involve rewarding myself with a Snickers. A weekly goal is to be able to report a weekly reduction in my weight. This will show better than anything that I am on program. A monthly goal is to see some physical improvement—whether it is fitting into old suits, or being able to cross my legs or see my toes (this month’s achievement). Then I have several feel good goals. These include: (1) I’ve loved riding horses all my life and want to get back on one; (2) I was a paratrooper in the Army and I WANT TO JUMP AGAIN! One week down; a lifetime to go! As of this morning I have completed one week on my program (I have friends who scold me for saying ‘diet’ as if it is a dirty word). I started on Maundy Thursday (the Thursday before Easter 2014). I am going to go forward counting each Friday as another week and a mini-goal adding up to my final goal of one year on program. Over the last week I have weighed myself a few times—usually at my wife’s insistence—but will do a regular weigh in each Friday. 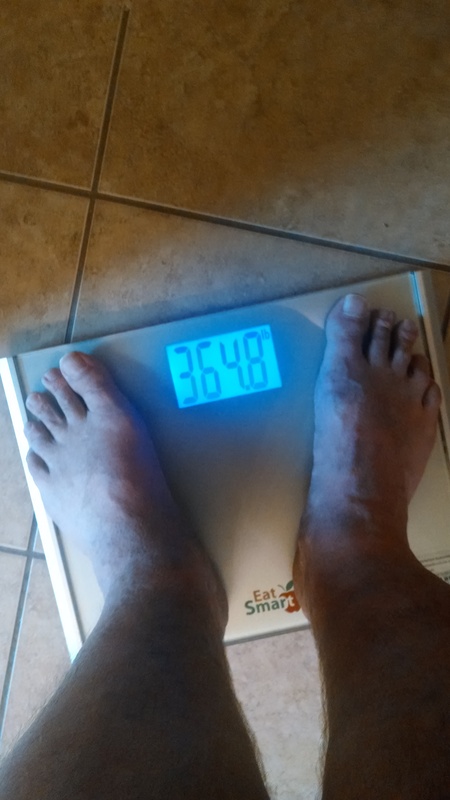 Though I will do others, I hope to remember to take a picture of the scale display each week and post it—please excuse my twisted toes and hairy calves in the shot; I’ll try not to accidentally include any other body parts. I weighed on the Thursday I started the program and later that day met with my doctor, whose office scale verified my weight as being 384 pounds. So that is my start point. Today, a full week later I weighed in (on the same scale, at the same time of day and in the same state of dress) at 364 pounds. That is a twenty pound drop in a week. Of course, I keep getting warnings now from some friends about the dangers of losing weight too fast. However, I am not doing anything extreme. I have simply limited my food intake to a healthy level and monitored the types of food to those which encourage weight loss while providing plenty of sustenance. I am not hungry, other than the occasional slight pang. Those are easy to overcome because I am always within three hours of being able to eat something. Yesterday, I started adding in a bit of mild exercise to my program (about 20 minutes on a rebounder trampoline while watching the morning news). In another week I hope to get back on my bicycle for a few minutes each day. There were two noticeable victories this week that only someone as overweight as I would understand. Wednesday I was able to cross my left foot over my right knee and set there comfortably talking to a friend. This had been impossible before. Yesterday, while getting dressed I realized when I looked down without bending at the waist, I could see toes. I haven’t seen those guys in some time. I have to say I kind of missed them. So far so good! Now, I’m off to meet a fellow pastor for coffee and some theological and philosophical discussion. This will be my first time going into a place that serves forbidden prepared foods since I started the program. It will be a good exercise of the will. Since I have started this blog on my commitment to make healthy choices, starting with a year on Take Shape for Life’s program, I have wondered about a domain name. Nothing seemed to work. Those that were available weren’t a good choice for what I wanted to say. Those that fit well with my theme weren’t available. Of course, there was still the question of refining my theme. Why and I writing this blog? Is it only to hold me accountable? I could do that with a thousand other ways. Is it to assuage some narcissistic need? I sure hope not. Over the last few days I have considered this question. Yesterday’s post helped me to cement the idea and this morning I discovered the perfect URL was available—which I quickly bought and configured. The purpose of this blog is to journal about the changes made by someone with a history of bad health choices. I don’t just want to share “This is what I ate,” “This is how I felt,” or “Look how much I weight now.” Though there is nothing wrong with these. They are important and can be helpful. I want to share the decision making process, thoughts on choices good and bad. Yesterday I spoke a bit about temptations and about a couple temptations I have faced. Last night was another such time. My wife sat across from me eating my favorite meal—seaweed, beansprouts, kimchi and rice. My wife is Korean, by the way. Of course, I can’t share it for three reasons: (1) the rice is full of carbs; (2) the seaweed is flavored with more salt and oil than I am permitted; (3) I had already prepared and consumed my Lean & Green meal. Some would claim this restriction to be too severe and think such foods should be fine—“Go ahead, you’ll enjoy it.” There are two other reasons for not partaking. One is a matter of my own limitations. Do you have a food that you just know once you start you will not stop until it is all gone? For many it’s potato chips or ice cream. For me it has always been rice, seaweed and beansprouts—at least since my wife introduced me this addictive combination. I love that stuff! There is no eating a half cup of any of it. Once I take the first bit the diet and changes are over—reset the clock back to zero. This brings me to the second of these two. I won’t partake because I have set myself a standard of complete compliance with the program for one year. I wasn’t forced into it. I didn’t decide lightly, or start this on a lark. I made a life choice to go through this. If this means a year depriving myself of my favorite meals then that is the choice I freely make. It takes far more self-restraint to do this, and I choose in this case to take the harder road. I tried the programs that promise you results without any temptation, without any effort, without any cost. At my weight and with my health I needed something more drastic. I choose to deny myself for a year; to not eat the meals I love; to choose for myself when I will and will not eat them. For the next twelve months, I chose ‘not.’ This doesn’t mean year of hardship or a deprivation, to fight through with clenched teeth and white knuckles. I see it is a time to not do what I want, and instead do what I need—and if nothing else, to act in a way that is reasoned and chosen rather than out of habit or sheer pleasure. After that year, I can rethink everything and decide if continuing on this program is the right course of action or not. But here is one way to look at it. I have set a date of Easter 2015 as the target. If I give up before that and decide to stop the program, I will never know if it was a free choice or if it was weakness and a lack of will. If I set such a date then the only way I can know my actions are still freely chosen is to remain on track with the program. 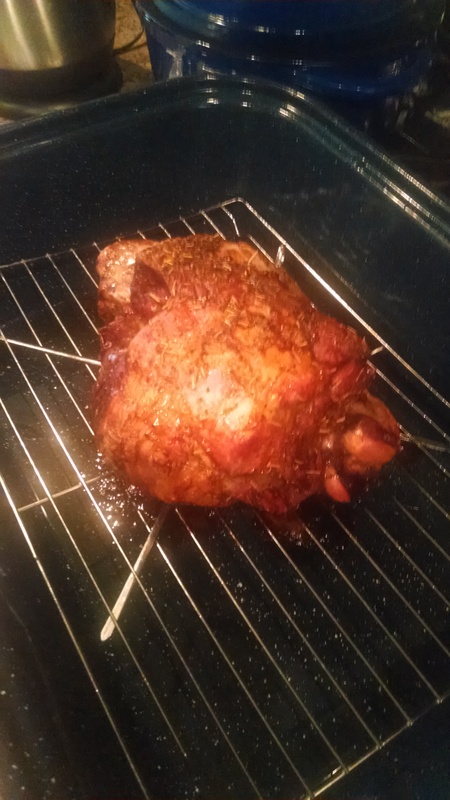 Yesterday I fixed a nice lamb roast to portion out for several meals. I seasoned the entire five pound roast with less spice than would normally be allowed for a single meal: rosemary, black pepper, paprika, a light touch of garlic and kosher salt. I will include some pictures. 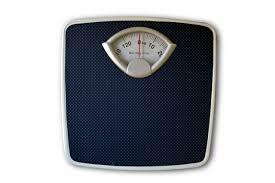 Funny thing about looking at the scale and seeing results is the temptation to think, “Things are going so well I can cheat just a little bit and make up for it later.” This is a killer thought for me right now. 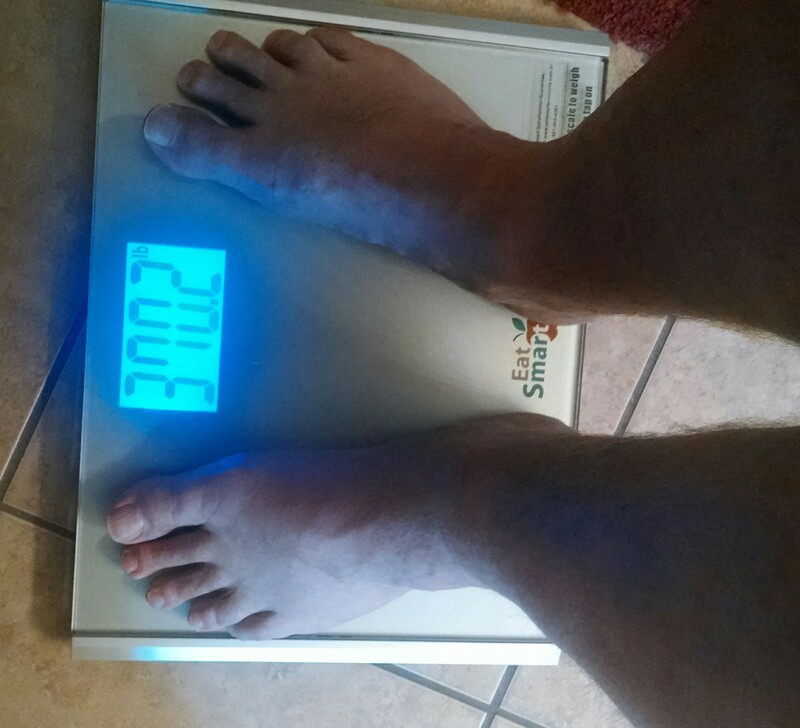 Like I posted before, I weighed yesterday and am down 14 pounds from when I started. Now, I find myself tempted in ways I didn’t even notice before. Of course, the only proper way to respond to bad temptations is to not give in. This afternoon, while roasting some lamb to portion for meals over the next few days, I opened the pantry looking for foil and my eye caught the new package of tortillas my wife just picked up yesterday. If there is one thing this Texas boy loves, it is flour tortillas. I swear each one of those things is hand made by an angel (daydreaming about tortillas while wiping away that little bit of saliva at the edge of my mouth). My hand reached out like it was on autopilot for the package, when I realized what I was doing and stopped myself. I chose to replace the forbidden with something permitted and allowed myself to have about a dozen pistachios. As a pastor, I have spent lots of time counseling young people about temptation and how to avoid it. Following your own advice is way harder than giving it. One way to avoid temptations is to replace the pleasure from the forbidden with something permitted. Fortunately my plan allows an assortment (a small assortment) of small snacks. I can have a few almonds or pistachios (which my wife lovingly made sure to bring home along with that tempting package of tortillas); I can also have dill pickle. These can be quick relief for temptation without knocking me off my program. 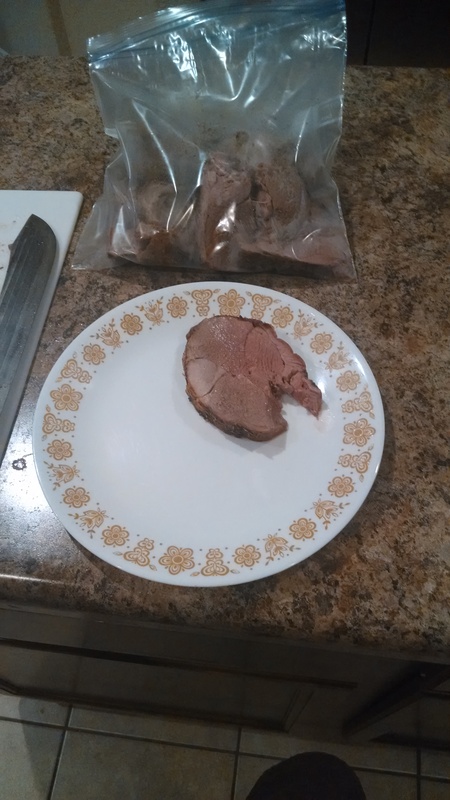 Today I decided to cook an elk roast given to us by a friend a while back. My plan was to finish it and then portion it out to package for my meals over the next few days. When I opened the package I discovered that it was not a roast, but was four nice elk steaks. Once cooked they were each already small enough to serve as proper portions for my program. In case you are wondering how I cooked them, I grilled them over coals. Yes, I posted yesterday about the cast-iron grill plate I use on the stove. However, nice elk deserves to be treated with time and a kiss of smoke. For flavor I added a couple of chunks of hickory to the coals. I thought my wife would join me, but she didn’t want the elk, so that just means more for me. I have three elk steaks in the fridge to get me through a few meals. Today is my fifth day on the program. I no longer feel tired and weak. I no longer feel hungry, other than the occasional small hunger pangs when it is almost time for my next meal. On my first morning on the program I weighed myself at 384 pounds. Later that day a trip to the doctor confirmed that weight. Today I weigh 370 pounds. I doubt I’ve lost 14 pounds of fat in five days, but have probably lost excess fluids as inflammation is relieved. I am noticing a change and so are others.